From DBI Sala (part of DBI Sala), the ultimate in fall protection, comes the most comfortable, lightest-wearing, truly innovative safety harness ever created: the ExoFit STRATA. Featuring the exclusive LIFTech load distribution system, the ExoFit STRATA literally takes the weight off your shoulders and redistributes it down to your hips, dramatically reducing shoulder strain and fatigue. Additionally, its PolarMesh padding delivers advanced breathability, the EZ-Link quick SRL adapter simplifies connecting and disconnecting your personal SRL, like the Nano-Lok and Nano-Lok edge. If your safety harness is weighting you down, "Lighten Up" with the ExoFit Strata. 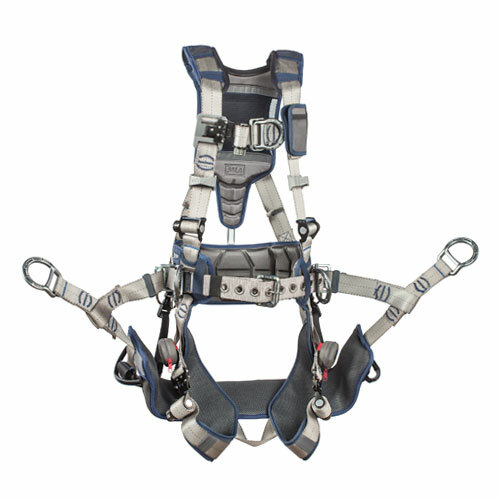 This harness features D-Rings on the back, front and sides, plus a removable seat sling with positioning D-Rings.